I am a practising visual artist trained in traditional academic painting and drawing techniques. I spent over two years studying at the Angel Academy of Art in Florence, Italy. The academy had a strict curriculum based on the methods used by French Academies in the late 19th Century. It placed an emphasis on a high level of draughtsmanship in both drawing and painting. I have been practising as a professional visual artist for the past 8 years. My work has been exhibited in the US, UK and Australia. I have been the recipient of a number of awards, scholarships, residencies and I recently featured on Sky's Landscape Artist of the Year and Sky's Portrait Artist of the Year. I have experience teaching workshops in traditional painting and drawing methods, tutoring privately and running online art courses. 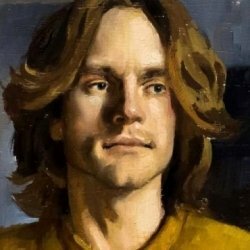 I will be able to help anyone seeking a stronger grounding in traditional drawing and painting techniques than is typically provided by the art faculties of contemporary schools and universities. I am happy to teach people of all levels, from beginners who haven`t picked up a paint brush in their life to experienced artists who would like to incorporate new methods into their work. While there are specific exercises and approaches which I believe all burgeoning artists should practice I am welcome to altering my approach to suit those seeking to incorporate traditional approaches into their work rather than learn a new system of drawing and painting from scratch. If you think that I`d be able to help you develop as an artist please feel free to get in touch and we can figure out what sort of approach will work best for you. KieranFrom Michele (5/5): I am a complete beginner and Kieran has been a great teacher , I would definitely recommend him . KieranFrom Mike (5/5): Kieran has been an excelent tutor to my son and without his tutoring he would have not gained entry to the university of his choice. I would highly reccomend him.